I think the general public are now domain-aware enough to recognize that the reason you don’t have your exact-match domain is because you couldn’t afford it. I do think Tesla would be better served owning Tesla.com as this would increase the perceived value of the brand. Compare to GM.com, Ford.com etc. As far as adding modifiers (additional words) to your brand in order to acquire the domain name: That you have to add a modifier implies higher word value in your brand itself, which implies more competition with trademarks. As a young bootstrap startup you may be better off adding the ly or io to your name because your trip to the trademark office will be that much easier as well. It’s not the end of the road for .com, not by a long shot and Elon Musk’s Tesla has shown the way. Tesla, a pure Internet play, was unable to obtain Tesla.com. The herd in the world of startups would have insisted Mr. Musk could not go forward with the name Tesla without owning Tesla.com – they would have demanded it be changed to something like Electicarly.com or whatever domain was registrable. Tesla correctly went forward with a modified domain, TeslaMotors.com. In this case the modifier “motors” was chosen, but the possible modifiers are nearly infinite. Here is a list of the 5,000 most common .com modifiers. via Igor | How to Get a Great Dotcom Name: Tesla Leads the Way. Another thing that popped into my head after reading Elliot’s posting was that out of the few dozen sales I have made through brokers, two were to buyers who had previously bought domains from me. One of these two repeat sales was for over $1 million and the other was for around $20,000. In both cases they were to contacts at these companies that were different than who I was usually dealing with. The brokers had no way of knowing this, so it was not their fault, I just was surprised by it. But, I was still happy I got the sales. Overall I would much rather use a broker than try to find a buyer for a domain by myself. Elliot has a good list of domain brokers at http://www.domaininvesting.com/guide/list-of-domain-brokers/. The only thing I would add to it is that Flippa.com is also a good way to sell domains. I have found the sale prices to be on the low end, but if you are eager to sell, at least you will find some bidders. You can always set a reserve so it does not sell for less than you are looking for. via Working With Domain Brokers | DomainInvesting.com. In other words, a cut from the sale of every .io domain goes to the British government for the administration of a territory whose original inhabitants should arguably be getting that money, and whose only current inhabitants are 5,000 U.S. troops and spooks, their civilian contractors, and a handful of British personnel who are there for policing and customs purposes. When I approached representatives of the Chagossian community, they said they had been unaware that domains associated with their homeland were being sold for profit. via The dark side of .io: How the U.K. is making web domain profits from a shady Cold War land deal — Tech News and Analysis. If BuyDomains negotiated like Frank Schilling, it would sell a lot fewer domains per year. But would it make as much money, and not have to worry so much about replenishing its inventory?You could take it to the extreme on a much smaller portfolio, like that of Rick Schwartz. In Rick’s case, he hits the lottery every once in a while. It’s very inconsistent compared to BuyDomains or even Frank Schilling.BuyDomains, as a large business with employees and outside investors, needs a certain level of consistency that is harder to a achieve with a higher priced, fewer sales strategy.Between the BuyDomains model and Schilling is Marchex, which probably has a higher typical selling price than BuyDomains, but has a much lower sell-through rate as a result.I’d probably put HugeDomains in the same bucket as BuyDomains — high volume, low prices — although I’ve seen some sales that make me question that. via BuyDomains and the economics of large domain portfolios | Domain Name Wire | Domain Name News & Views. Endurance International Group Holdings, Inc. EIGI, which bought Directi for $110 million ealier this year, has purchased the assets of BuyDomains.com according to its financial results for its third quarter ended September 30, 2014. Endurance also owns a number of domain name registrars and hosting companies. “During the quarter, the company acquired Webzai, Ltd. and the assets of BuyDomains. In addition, on October 31, 2014, the company acquired the assets of Arvixe, LLC.”This is the first report of that BuyDomains was sold by Name Media or that Endurance purchased it. BuyDomains reportedly owned hundreds of thousands of domain names. via Endurance International EIGI Acquires The Assets of BuyDomains.com. Local businesses need to attach their brands to strong domains. While Google has not explicitly confirmed that there is a bias toward brands in their ranking algorithm, many SEO practitioners have suspected as such since 2008, when then-CEO Eric Schmidt famously said that large brands served as a signal of quality, trusted content. With Pigeon, our immediate impression was that big brands with national reach and large, established directory sites were the winners. In other words, if you are a big brand and/or have a strong domain, you are in good shape. To verify this assumption, we hooked into the Mozscape API and compared two key linking metrics (external equity and page authority) to see how performance changed post Pigeon. via Factors Affecting Pigeon — A 5,000 Page Case Study. 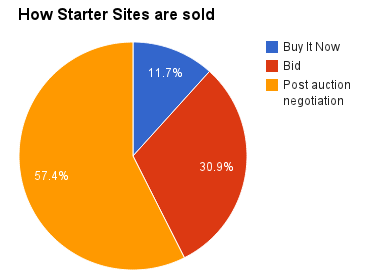 In fact, 57% of Starter Sites are sold after the auction ends. This is great news for Flippa sellers who didn’t get to sell their website during the auction period – as long as you’ve listed your Starter Site, it’s likely that an interested buyer is just around the corner ready to make you an offer for your website. via Revealed: The Niches with the Highest Chance of Selling, and more! | Flippa Blog. In Auction At Snap: Gynecologist.com & Obstetrician.com: Is Moniker Pulling A Tucows? There are two great bang on medical domain names in closed auctions at Snapnames.com, Gynecologist.com & Obstetrician.comMore about the auctions in a few, but the history of the domain names may indicate that Moniker has gone the way of Tucows and is picking up expired domains for its own account and then selling them instead of letting the simply drop. At least they are sending domains to auction. Enom might just keep the domain or sell it privately. via In Auction At Snap: Gynecologist.com & Obstetrician.com: Is Moniker Pulling A Tucows?. Posted byJohnH September 12, 2014 Posted inContributorsTags: Michael BerkensLeave a comment on In Auction At Snap: Gynecologist.com & Obstetrician.com: Is Moniker Pulling A Tucows? Namecoin is a fascinating substitute for the domain name system because, like Bitcoin, it is completely decentralized and censorship-resistant. Proposed censorship measures like SOPA and PIPA simply could not apply to Namecoin because it is virtually impossible to reverse or interfere with name registrations, which are enforced with strong cryptography. New top-level-domains are added by the consensus of the miners, just as Bitcoin miners must agree on the rate of growth of Bitcoin’s money supply. Speaking of new top-level domains, the Namecoin community, such as it is, appears to be considering expanding beyond .bit to .tor. These latter domain names could be used for sites run as Tor hidden services, such as Silk Road 2.0. Instead of having to remember a URL like silkroad6ownowfk.onion Silk Road 2.0′s current URL, the proprietors of the site could simply register silkroad.tor and point it at the onion URL. Creating memorable Tor service addresses would remove one of the main stumbling blocks to use of the censorship-resistant network. This would in turn strengthen the hand of political dissidents not just black marketeers all over the world. via Can Namecoin Obsolete ICANN and More? | The Ümlaut. Of course I’m angry with the person or people who stole the site, but that’s out of my hands. The reason I’m writing this post is to let people know that this really can happen – to anyone – and to offer suggestions for how to minimize the chances that it will happen to you below, but beyond that, I’m writing this post because this incident made me very, very angry at GoDaddy and HostMonster. And I want you to know why. via My Website Was Stolen By A Hacker. And I Got It Back. | Ramshackle Glam. via Frank Schilling and the rise of the web domain name industry – FT.com. via Rachel Aviv: The Scientist Who Took on a Leading Herbicide Manufacturer : The New Yorker. The idea with Demand was to marry two businesses: domain name registration and low-cost content production. The foundations were the acquisitions of eHow.com, a provider of how-to tutorials, and eNom, a domain-name registration service provider. Early on, Demand used eNom’s 1 million generic domain names such as “3d-blurayplayers-com” to serve up relevant ads to people searching for specific topics. These “domain parking” pages were immensely profitable, generating north of $100,000 per day, according to a former Demand exec who requested anonymity. “That’s $35 million-$40 million per year without doing any work,” the exec said. But the tactic was fundamentally a bait-and-switch. Users landed on the pages expecting to find information on a subject and instead found an ad. To try to drive up traffic, Demand shifted its strategy, populating the sites with thematically related content. Counterintuitively, though, that decreased ad click-through, since people were reading the articles instead of the ads, according to the former executive. via Demand Media: Rise and Fall of a Content Farm | Variety. This is a list of the top 20 highest prices paid for domain names. via List of most expensive domain names – Wikipedia, the free encyclopedia. Harris said her office two months ago launched investigations into the websites imitating coveredca.com, which began offering insurance coverage for sale on Oct. 1. The website operators were sent cease and desist letters telling them their sites violated state law and demanding their removal or transfer of their domains to the state exchange. Capitol Alert: Kamala Harris shutters 10 fake Covered California websites. via The Secret of EMD: Exact Match Domains Revealed. via DomainNameSales.com Sales report – First 6 months of 2013 report. | TNTNames.com. via Thanks To A Six-Figure Purchase By Reputation Changer, Brand.com Is A Thing Now | TechCrunch. To make things worse, Mint gave a “substantial” amount of Series A stock to Hite Capital in exchange for the Mint.com domain name. That stock was worth a “couple of million dollars,” says one source, after the acquisition. via Mint Is Yodlee’s YouTube | TechCrunch.